The tart flavor of cranberries is a great addition when making a cake, for the holidays or anytime. 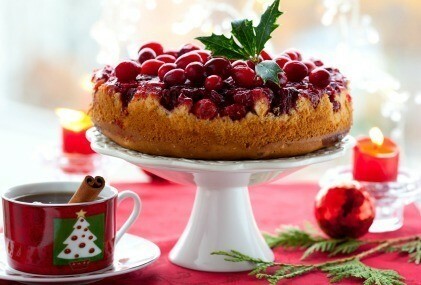 This page contains cranberry cake recipes. This is a frozen cake dessert that has Cool Whip, cranberries, angel food cake, and cream cheese. This recipe is like frozen cakes you buy at the store, only better. Set aside 9 x 5 x 3 inch loaf pan lined with heavy duty aluminum foil. In a mixing bowl beat cream cheese, sugar and salt. Spread 1/3 of this mixture in prepared foil covered pan. Top with three cake slices trimmed to fit pan. Top with remaining cranberry mixture. Cover and freeze. Take out 15 minutes before serving. Use foil to remove loaf from pan. Then discard foil. Preheat oven to 350 degrees F. Cream butter and sugar until fluffy. Add eggs and almond extract and beat well. Combine flour, baking soda, baking powder and salt. Add dry mixture to creamed mixture alternately with sour cream. Spread 1/2 of batter into well-greased and floured 10 inch tube pan. Spread cranberry sauce over batter. Top with remaining batter. Bake 50-60 minutes or until lightly browned. Cool 10 minutes. Remove from pan and cool completely. Drizzle topping over cooled cake. This is such a festive cake for either Thanksgiving or Christmas and so moist. My son who does not care much for cranberries, likes this cake.